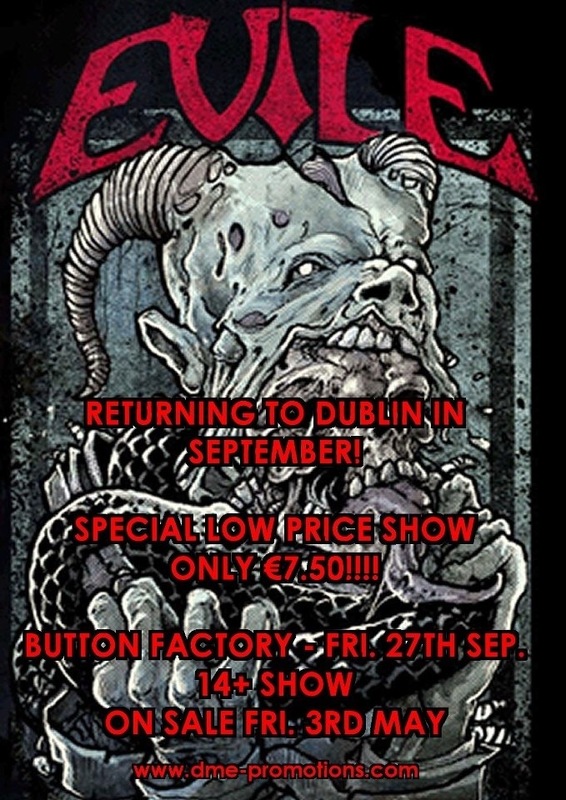 After playing to a sold out crowd at The Academy last night, EVILE announced they’ll return to the Button Factory on September 27th – and they’re doing it on the uber-cheap with tickets costing just €7.50. Evile were in town supporting Kreator and are currently readying their new album, SKULL which is due for release on May 27th. Tickets go on sale May 3rd and the show is 14+. Check Dublin Metal Events (D.M.E.) for more details on support. This entry was posted on April 27, 2013 at 9:59 am and is filed under Gig Listing with tags Button Factory, Evile, Kreator, tickets. You can follow any responses to this entry through the RSS 2.0 feed. You can leave a response, or trackback from your own site.